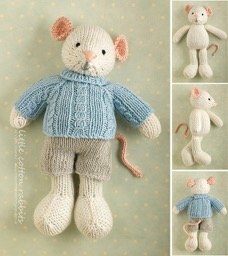 Learn fantastic tips and tricks for knit toy-making in our two-part class while you make this adorable mouse! This intermediate pattern is knit flat in pieces, seamed, then sewn together. The skills you will learn can be used with countless toy patterns! Please note, there are two Little Cotton Rabbits classes on the calendar, the Boy mouse pattern is easier than the Girl lamb pattern as the shoes on the female patterns are more challenging than the male animal patterns. Be Advised: This pattern is fiddly, the pattern designer herself admits this! You will be working on small amount of stitches, on small needles, doing different forms of increases and decreases that can be challenging to work on your needles. Intermediate experience preferred. Please feel comfortable knitting, purling, increasing, decreasing, picking up stitches, and working small amounts of stitches on small needles- US 0 or US 1s.